Riu Vallarta resort hotel features charming art deco-style architecture with stylish décor and a modern vibe perfectly suited to the wants and needs of all types of travelers. True to the RIU tradition, the resort offers endless activities, gourmet restaurants, and unmatched leisure. Riu Vallarta Riviera Nayarit was recently Nominated for Condé Nast Traveler Readers’ Choice Awards 2019. Beyond that, Riu Vallarta’s legendary All-Inclusive concept and renowned personalized service are certain to make this resort hotel a fantastic and unforgettable destination for a well-deserved Mexico vacation. Area Location: Riu Jalisco Nuevo Vallarta is located in the Flamingos Beach area on Banderas Bay, just 10 minutes from Puerto Vallarta Airport and 25 minutes to Downtown Puerto Vallarta. Beach: Located on the expansive Playa de Flamingos beach, Riviera Nayarit. At least 1 person 21 years or over in every room during the months of March and April. The remainder of the year, at least 1 person must be 18 years old or over in every room. No student groups under 21 or “Spring breakers” accepted all year round. Junior Suite Ocean View: all the above and furthermore with split level living room area, hydro-massage bathtub, iron and ironing board. Suite Ocean View: as Junior Suite Ocean View and furthermore with bidet, extra shower cabin and walk-in closet. 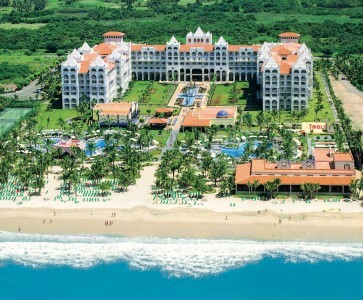 • 24 Hours All Inclusive snacks, alcoholic and non-alcoholic beverages. Buffet style with show cooking, serving international and local specialties.